Although it's really nice living where we are now, one problem i've encounted is I don't have such easy access to a farm shop. Our old farm shop sold locally grown produce, farmed in the old way, without the need for pesticides etc. The local supermarkets have organic fruit and veg but they are all wrapped in plastic, which is annoying, I hate seeing veg, sweating in plastic. 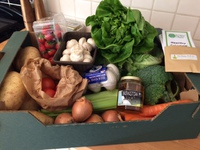 Luckily after searching for considerable time, I found a company who deliver fruit and veg boxes to your door also local honey and duck eggs etc, delivery is free and no plastic in sight, farmed in proper crop rotation from small holdings. Very pleased with this. All the produce in the box is seasonal of course and it's a surprise what you get. You always get some potatos but the other items are the surprise, as it depends what the farmer is harvesting this week. You also get a free recipe card to go with the items in the box and free herbs. Does anyone else have access to this service? No we don't Bella. Please could you tell me who this company is as we are interested. I was going to use one of these but found it so expensive it put me off and I bought organic from M and S but agree about the plastic which reduces the life of the product in hot weather. Waitrose organic veg seem to be the best out of all the supermarket but I have to drive a way to get to it. May try the box as you recommended it Bellatrix if you can tell us the brand please. Ah, it's not a brand. Mine is coming from Gorleston Veg boxes, it's local to me, as are all the small farmers who supply the produce for the boxes, as well as the honey and eggs. Likewise, Mr. Darling is local and he supplies the honey for the boxes etc. M and S are expensive anyway, are they not Badpuss? Thanks Bellatrix. I agree M and S are expensive but they and Waitrose provide the freshest organic produce around here. Riverford Organics was the company I looked at. I like this company and may use it as the owner is giving shares away to his employee so big shareholders cannot buy it up when he retires and change its ethics. I found a site called 'Off the farm' which farmers use to advertise their boxes in the way that Bellatrix mentioned. Some of these may not be organic which is what I want. The thing i've found with the "organic" label is that farmers have to pay a lot for this certification. Many small holdings may not be able to afford this "organic" label but know that their produce is grown in the old way without the need for heavy pesticides and insecticides. I'd say don't rule them out Badpuss, ask them how they farm and what they use. Crop rotation is the best way to avoid using harsh chemicals and if this is the method they use near you, you may be pleasantly surprised. I learnt this snippet when I went to a farmers market several years back and asked the stallholder if their veg was organic. He said it was such a shame that people think just because you don't have the certification sticker, your veg are toxic and it was simply a matter of the cost of having the soil certified and all the tests etc. Absolutely right Bellatrix. Sometimes I go to the WI market and their veg are nearly organic. They offer a box now. Will do as you ask and try to grow some ourselves. Would they deliver 2 Seattle? Sorry Annad. We collect from them locally. My box has arrived and I'm really thrilled! 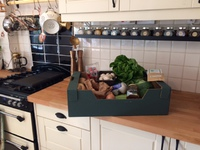 Box contains strawberries, duck eggs, honey, cabbage, cauliflower, big and plenty potatos, celery, Lettuce, Brocolli, Carrots, mushrooms, tomatoes, onions, recipe cards and free thyme all for £18.35 including delivery. Oh wow - thats great value - I would be really pleased at that!! !